Coupon code SPRINGSALE can get you the factory reconditioned Olympus 40-150mm f2.8 ED PRO lens for $956~ with free shipping and a 90-day Olympus USA warranty. It is not eligible for expedited shipping. The sale ends Wednesday at 10am ET or earlier if sold out. It is in-stock as of the time of writing. I tested the coupon and it works. The factory reconditioned Olympus E-M1 II body only can be yours for $1275 with free shipping and a 90-day Olympus USA warranty using coupon code SPRINGSALE at the Olympus USA store until Wednesday at 10am eastern or earlier if sold out. It is in-Stock as of the time of writing! I tested the coupon and it works. More B&H WPPI action. The Olympus E-M1 II body continues to go for $1700 at authorized dealers, same as last week when we posted our Mirrorless price charts, BUT if you also want to get the official Olympus HLD-9 Power Battery Grip (goes for $249 on its own), you can get them together as a bundle for $1898 at B&H Photo. An early bird update of the Stock Status Tracker has good news for fans of the Panasonic G9! The camera is in-stock and shipping in new condition from authorized dealer Samy’s Camera (one unit left per the page over there). The Olympus E-M10 III body only came out of the gate for $650 but it has its first serious discount, it is currently going for the rather unusual price of $584 with free shipping at B&H Photo and Adorama and Amazon itself. If you prefer to get the Olympus E-M10 II in new condition from authorized dealers instead of wait/hunt for a refurbished deal at the Olympus USA Outlet store, the prices of the three E-M10 II options are a $50 staircase: the body only goes for $450, with the 14-42 for $500, and with the 114-42 EZ for $550 at Adorama and B&H Photo and Amazon itself. You can find the different kits and colors at the root listings of the aforelinked retailers. 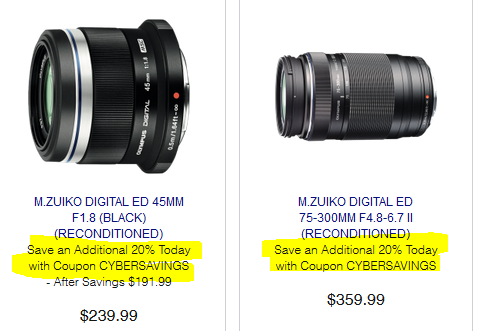 More Panasonic action, good until Saturday night, a Panasonic initiated instant savings promotion has dropped the price of the G7 with 14-42mm to $600, and the price of the G7 with 14-140mm f3.5-5.6 POWER OIS to $900 at various authorized dealers, some of which are also included FREE accessories. More things surfacing from our Mirrorless Price Checking. The new condition Panasonic G9 body only for $1700 is out of stock at the tracked authorized dealers, but if you are comfortable with used, B&H Photo has it USED, in “Condition 10” for $1530 with free expedited shipping. Used quantities are limited. If/when they run out of used, the used listing on their website will automatically redirect to the new condition. For the big picture, check the latest iteration of the Stock Status Tracker now with the Pentax K-1 II and Fuji X-H1 added. The GH5 with 12-60mm kit goes for $2400 and similarly Adorama has a super bundle for it for the same price. It’s back on sale for the price of $99 in new condition at authorized Olympus dealers, it is the new condition Olympus 40-150mm f4-5.6R micro four thirds lens at Adorama and B&H Photo and Amazon itself. At B&H and Adorama you get $4 promotional rewards as well, while at Amazon you get a $5 statement credit if you pay with Prime credit card (Chase VISA or Store Card). The lens is available in the usual black and silver color schemes. Panasonic just revealed the new GX9 with 12-60 for $1000, and it is often the case, it means discounting on the previous models. The Panasonic GX85 with the 12-32mm kit lens is now bundled with the 45-150 f4-5.6 lens AND a $100 Adorama gift certificate and $24~ promotional rewards, all these for $598 with expedited shipping at Adorama in your choice of silver color scheme or the black color scheme. 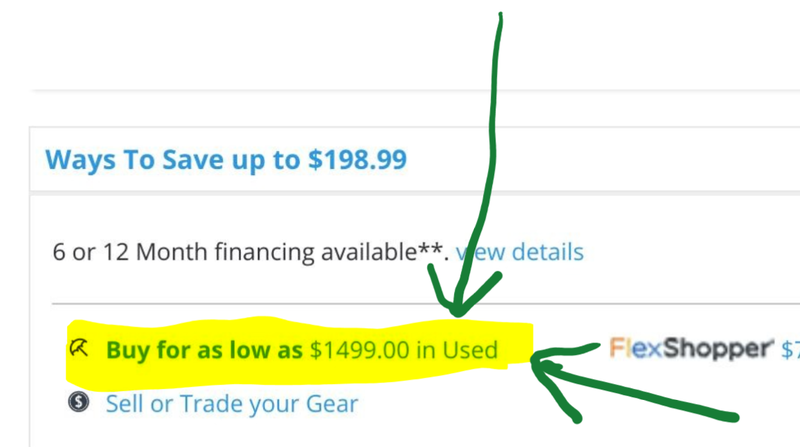 The previous time Adorama had a similar promotion in last December 2017 it was with a $50 gift card instead of a $100 gift card! The price is certainly right for a “take pictures with” entry-point into Micro Four Thirds. You pay $600, you get a camera, two lenses, and $124 “buying power” for future purchases at Adorama. As we mentioned last week, starting at 1pm eastern time (10am pacific) today, B&H Photo will be hosting for FREE Panasonic GH5S LIVE Streaming Panel Discussion featuring a photographer, a cinematographer, a post production person, along with a Panasonic representative and a panel host. A party of five. I mean, a panel of five! As usual, it will be free to watch. You can ask questions using the Twitter hashtag #BHPhotoLive. The latest estimate for the Panasonic GH5S release is Monday February 5 (2018) according to the B&H Photo Pre-Order page. Its starting price is $2500, versus $2000 for its GH5 predecessor. If you are curious about the upcoming Panasonic GH5S, or you just love panel discussion of new camera gear, Save the Date! On Wednesday January 31st in 2018, at 1pm eastern time, B&H Photo will be hosting a Panasonic GH5S LIVE Streaming Panel Discussion featuring a photographer, a cinematographer, a post production person, along with a Panasonic representative and a panel host. A party of five. I mean, a panel of five! As usual, it will be free to watch. You can ask questions using the Twitter hashtag #BHPhotoLive. The big news of today’s update of the Stock Status Tracker is on the Panasonic G9 front! Adorama has limited quantities in “Used – Demo” condition for $1499 plus shipping! When the used options sell out, you will not see the Panasonic G9 at the aforelinked page. The previously mentioned Olympus E-M1 II with free Battery Grip Monday offer is also running at Adorama where for a limited time you can get the E-M1 II body only, the Olympus HLD-9 battery grip, and $74 promotional rewards for $1849 with free expedited shipping. If you want to buy some lenses with it as well for a combined purchase discount, expand the “Create Your Bundle and Save Up to $775!” over there, next to the yellow “Special Offer”, to see all the options. It’s Samyang time of the Micro Four Thirds kind at B&H Photo, where either the silver or the black color scheme of the new condition Samyang 12mm f2.0 NCS CS lens is on sale for $299 with free expedited shipping. On the same listing, you will find the black Sony E going for $289, while the lowest Fuji X price is $309 for the silver. Note that the prices of Samyang lenses are not always the same for all mounts, so keep that in mind when price-checking comparatively. This went as low as $199 during the late 2017 holiday shopping season deals, but if you don’t want to wait for it, at the moment, B&H Photo is offering the new condition Z CAM E1 Mini 4K Interchangeable Lens Camera for $249 with free shipping. This is a limited time offer but not a daily deal. We start digging into the reload of the Olympus Outlet store. We start with the factory recondition Olympus M.Zuiko Digital ED 45mm f1.8 (Silver) going for $174 with free shipping and a 90-day Olympus USA warranty. No coupon is needed (thankfully!). It is shown as in-stock as of the time of writing, and with 1-2 business days for processing, with expedited shipping not available. Olympus Outlet Store refilled: 32 items now! The Olympus USA Outlet store has been refilled since our last check yesterday. They now have a total of 32 items, up from 9 yesterday! The two not-working coupons that were shown yesterday are no longer mentioned. I will try to digest these later today, but I’m posting this now so you can check for any hard to find items that may sell out by the time I get around to “digesting” it all. I also have to “digest” today’s CES action, which is the official Day #1 of the Las Vegas trade show. The factory reconditioned Olympus M.Zuiko Digital ED 45mm f1.8 goes for $240 with free shipping and a 90-day Olympus USA warranty in the black color scheme at the Olympus USA Outlet store. It is in-stock as of the time of writing. The coupon is a limited time offer. In new condition, this lens goes for $324 at authorized Olympus USA dealers such as Amazon itself and Adorama and B&H Photo.